Step 1: Make some play dough together and let your child help with the measuring, stirring and kneading! Step 3: Lay out all the objects with the play dough and start exploring together! Step 1: CJ loves kneading and mixing. So generally we make white play dough and then knead in colors. *White play dough recipe - here or you can also use the recipe from The Imagination Tree site posted with the challenge (see the above link). Do visit her site for a variety of play dough recipes! Step 3: CJ had fun exploring with the silly shapes. We have been doing The very Hungry Caterpillar book - life cycle of Butterfly crafts that she made one with play doughs. 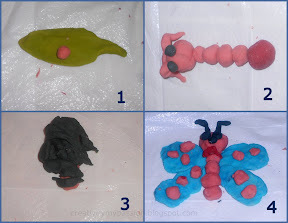 Cute playdough ideas. We LOVE playdough. How fun!! I would love it if you would share it at my sharing party at http://craftymomsshare.blogspot.com/2011/11/sharing-saturday-5.html. Thank you! You have been amazing at joining in at all the Play Challenge activities. Such fun at your house. kool-aid play dough yet another item on my to do list! the girls would love the scents! I hope to do some during our upcoming 5 senses week! Thanks for sharing this on the sunday showcase. I look forward to seeing what you'll share this week.